Lovely card, great image too. 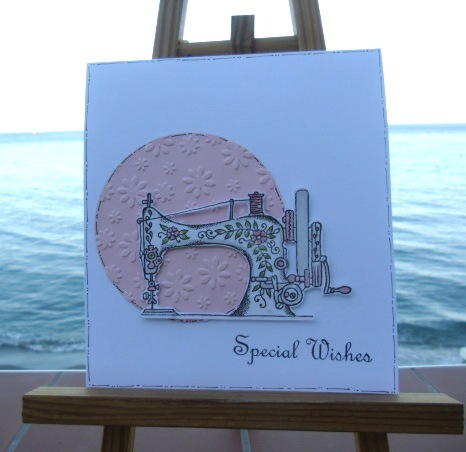 Great sewing machine stamp,lovely card. Lovely card Sylvie and love the sewing machine...yippee we have sun here in the UK too...about flippin time! This looks great Sylvie... lots of fiddly cutting out here! Enjoy your evening and well done on your weight loss! Hi Sylvie, love the card and the stamp is fab! Hi Sylvie, this is fab, the sewing machine is ace. Great LIM card. Love your vintage machine Sylvie it's beautiful! Enjoy your Moroccan evening. It's sunny today but not that hot! There's a nostalgic feel to this card which I really like. And the design is wonderful! Stamp is just wonderful. Great card. Gorgeous image and you made a beautiful card with it! Sounds like a fabulous evening...enjoy! The sewing machine looks great with the gorgeous embossed panel. Kind of 'vintage' but still with an elegant CAS feel. Neat layout and a great answer to the challenge when one doesn't sew (like me, for example). That's a gorgeous sewing machine. Very sweet and pretty colors! Hola Sylvie, gorgeous card, i love the colours and your sewing machine, good work Sylvie. Gorgeous & Elegant LIM creation ! Great card Sylvie; love the image and colours. For once we have matching weather, lol! what a beautiful card, sylvie... that sewing machine image is so lovely! Fabulous card Sylvie, your sewing machine is just like the one I use, told you it was old lol. Great card - that sewing machine image is gorgeous! Sewing machines are really in right now. I can remember my grandmother haviing a Singer just like this pretty machine. Nice card! That is gorgeous! I have been hopping around and am getting to grips with the whole lim concept - and realising my effort has failed miserably!!! eek! I love the traditional sewing machine image. Sylvie, that vintage sewing machine image is wonderful! I think I "need" one like that!! Fabulous card! I love the cut out behind the sewing machine, a beautiful card. Catching up with commenting, and your cards, wonderful as ever. Your sewing machine is beautiful, my mum used to have something similar years ago ( but of course it was black & gold)love the beautiful pink you have used. A fab card.